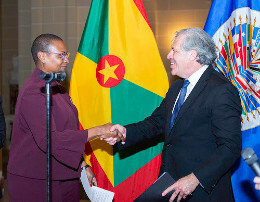 The new Permanent Representative of Grenada to the Organization of American States (OAS), Yolande Yvonne Smith, today presented her credentials to the Secretary General of the Organization, Luis Almagro. 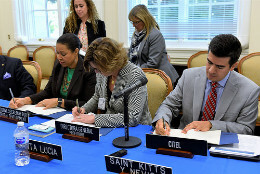 The Organization of American States (OAS) and El Salvador today signed an agreement for the deployment of an Electoral Observation Mission to the February 3 presidential elections. 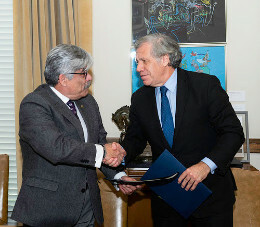 The Organization of American States (OAS) and Bolivia signed an agreement today for the deployment of a mission of experts to the January 27 primary elections that will determine the presidential tickets for the general elections of October 2019. 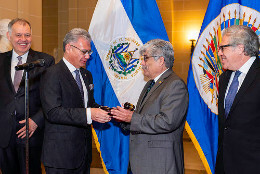 The Permanent Representative of El Salvador to the Organization of American States (OAS), Carlos Alberto Calles, today assumed the Chair of the Permanent Council -which rotates every three months- analyzing the challenges that the region still faces and that must be addressed in the debates of the political entity. The General Secretariat of the Organization of American States (OAS) greets Juan Guaidó as the new President of the National Assembly of Venezuela. 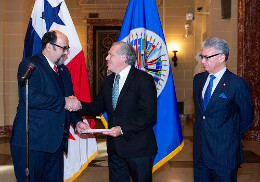 The new Permanent Representative of Panama to the Organization of American States (OAS), Salvador Sánchez González, today presented his credentials to the Secretary General of the Organization, Luis Almagro. 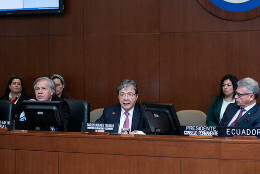 The Permanent Council of the Organization of American States (OAS) today approved a resolution to hold the next General Assembly of the Organization in Medellin, Colombia, on June 26, 27 and 28, 2019. 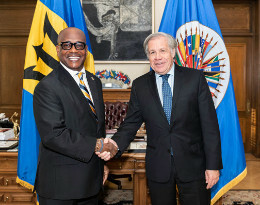 The new Permanent Representative of Barbados to the Organization of American States (OAS), Noel Lynch, today presented his credentials to the Secretary General of the Organization, Luis Almagro. 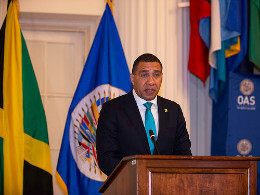 The Prime Minister of Jamaica Andrew Holness today addressed the Permanent Council of the Organization of American States (OAS) and highlighted the crucial role the Organization has played in the last 70 years in promoting security, democracy, governance, peace and overall wellness in the region. 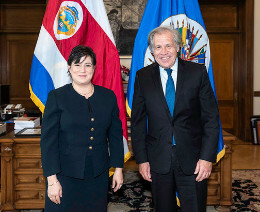 The Secretary General of the Organization of American States (OAS), Luis Almagro, received on Wednesday, October 17 Luiz Antonio Marrey, Spokesperson of the Mission to Support the Fight against Corruption and Impunity in Honduras (MACCIH), who delivered the fifth semi-annual report of the Mission. 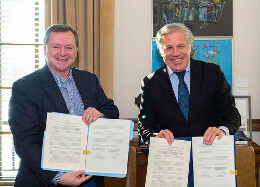 The Organization of American States (OAS) and the ProFuturo Foundation signed an agreement today to promote digital education in a hundred schools in five member countries of the Caribbean Community (CARICOM): The Bahamas, Barbados, Belize, Guyana and Jamaica.